Meath West TD and Junior Minister Damien English. 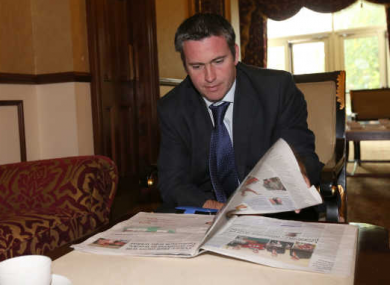 JUNIOR MINISTER DAMIEN English has said that it would be a “cop out” for his party to reveal the Fine Gael who suggested John McNulty’s name to Arts Minister Heather Humphreys. Humphreys says McNulty’s name was suggested to her as suitable candidate for a place on the board of the Irish Museum of Modern Art but both she and her party colleagues have refused to say who it was. Fine Gael argue that this is a party matter and, speaking on RTÉ’s the Week in Politics this afternoon, English suggested that the decision to recommend McNulty to Humphreys was separate from his actual appointment. “It is a private matter who the person is within Fine Gael. It would be a cop out to know who that person was,” he said. English added that Taoiseach Enda Kenny’s acceptance that he shoulders the blame for the ongoing affair is something that should be commended. “A Taoiseach has for once come out and said that he’s the Taoiseach and is taking responsibility. That should be viewed useful development in my view,” he added. Sinn Féin’s Mary Lou McDonald TD said that it would only be considered a positive development if “it was clear what the Taoiseach was apologising for”. “You have the bizarre situation where the Taoiseach has left you wondering what the apology is for. The minister is in a similar situation where she can’t give a straight answer,” said McDonald. I believe that Heather Humphreys was acting under the instruction of the Taoiseach or those acting on behalf of the Taoiseach. So in my view he needs to come out and give a clear unambiguous answer to the questions. Email “Minister: It would be a 'cop out' to reveal Fine Gael official ”. Feedback on “Minister: It would be a 'cop out' to reveal Fine Gael official ”.